Weighing Capacity: 10g/50.00ct or 20g/100.00ctDivision Size: d=0.002g/0.01ctAccuracy: Class IIGram/carat/ozt/grain conversionWeight references providedLow voltage indicatorAuto power down function after 10 minutes from the last measurementPCS-50LFT certified Legal for Trade in 34 states in the U.S.
* Presidium Carat Scale (PCS-50/PCS-100) is a compact scale that utilizes advanced circuitry design and surface-mount technology to weigh gemstones of either up to 50.0ct or 100.00ct, precisely and accurately, for long periods of continuous usage. * Each scale come with its corresponding weight reference of either 50.0ct or 100.00ct for calibration. * The PCS-50 is also available in the United States of America as the PCS-50 Legal For Trade (PCS-50LFT). * It is the first portable carat scale to be certified "Legal For Trade" by the U.S. National Conference of Weight and Measurement. * Meets requirements for commercial weighing and measuring equipment in the U.S. by the National Conference of Weights and Measures. * Specifications / Power & Battery:1) No batteries needed.2) This product comes with a protective carrying case box. * Presidium Dial Gauge measures from 0.0 to 23.0mm in 0.1mm divisions. The PDG features an easy-to-read millimeter and carat scale, and is only dial gauge in the industry that combines dual measurements for gemstones in millimeters with corresponding carat conversion for round brilliant-cut gemstones. PDG also contains an inner scale display for US ring size measurements. * The PDG is manufactured to the highest quality and features a patented anvil with a non-metallic lubrication-free rack and pinion technology that resist wear and tear and maintain its accuracy. * Presidium Duo Tester (PDT) is the only comprehensive tool on the market that combines two proven testing methods for gemstones. PDT differentiates diamonds from its simulants based on both their thermal conductivity and reflective indexes. Coated gemstones can also be generally tested with the PDT. * The Presidium Duo Tester comes with a probe pen that has a retractable probe tip which ensures consistent pressure against the gemstone during testing for more reliable results. With the industry's thinnest probe tip size of 0.6mm, PDT tests gemstones as small as 0.02ct. * Does not differentiate between natural and synthetic colored gemstones. 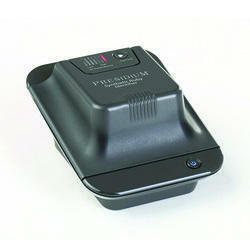 * Presidium Gemstone Tester / Colored Stone Estimator is the only colored gemstone thermal tester in the industry. It provides a quick and easy way to identify diamonds and separate common colored gemstones from one another based on their thermal conductivity. Coated gemstones can also be generally tested with the PGT/CSE. * The Presidium Gem Tester / Colored Stone Estimator has a retractable probe tip that ensures consistent pressure against the gemstone during testing for more reliable results. With the industry's thinnest probe tip size of 0.6mm, PGT/CSE tests diamonds as small as 0.02ct. * Does not differentiate between natural and synthetic colored gemstones. * The Synthetic Ruby Identifier by Presidium is a ground-breaking desktop device that instantaneously identifies synthetic (flame fusion) rubies through its characteristic high UV transmittance. Utilizes UV light with auto cut-off and gives quick results with clear indicator lights to measure the UV transmittance ability of ruby gemstones. * Works on both single mounted stones (with open-back setting) and loose rubies. * The epitome of style and cutting-edge technology, Adamas diamond and moissanite tester comes with a changeable probe tip and allows you to replace any worn or damaged probe tip yourself, eradicating and reducing any equipment downtime. It can also be used with a special micro probe tip, available separately, which is able to authenticate colorless diamond melees as small as 0.01 carats. * A hallmark of design featuring a dynamic LED display and a sleek ergonomic grip, the premium choice Adamas tester is precise, reliable and made of excellent quality. * The Presidium Diamond Mate Tester (PDMT) has a retractable probe tip that ensures consistent pressure against the gemstone during testing for more reliable results. With the industry's thinnest probe tip size of 0.6mm, PDMT tests diamonds as small as 0.02ct. Test results are instantly indicated by an LED light and continuous audible beep. * It comes in 2 variants, either powered by 3 AAA alkaline batteries (Presidium Diamond Mate-A/PDMT-A) or by an inset rechargeable battery (Presidium Diamond Mate-C/PDMT-C). PDMT-C comes with rechargeable battery in the unit and an AC adaptor (120 or 230 volts). * Pocket-sized instrument that instantly verifies the authenticity of diamonds based on their thermal properties. * Handheld tester that instantly distinguishes moissanites (a diamond simulant) from genuine diamonds, based on electrical properties. * The Presidium Moissanite Tester II (PMT II) measures the electrical conductivity of the gemstones directly, determining if the gemstone is a genuine diamond or a moissanite (a diamond simulant). * Presidium recommends the use of the Presidium Moissanite Tester II after a positive test result for diamond is indicated on a thermal conductivity diamond tester (such as the Presidium Diamond Mate Tester). 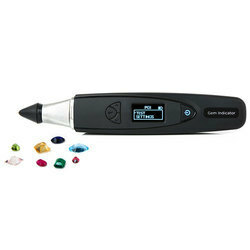 * Convenient all-in-one handheld instrument that instantly separates diamonds from moissanites and other diamond simulants, based on their thermal and electrical properties. * The Presidium Multi Tester III (PMuT III) is the all-in-one instrument that reliably and accurately verifies the authenticity of colorless diamonds against moissanites and other diamond simulants such as colorless sapphire, colorless spinel, cubic zirconia, zircon, etc. Showcasing a new ergonomic design with a rubberized anti-slip grip and an all-around display for easy readability, PMuT III promises greater ease of handling and reading of results whilst testing. 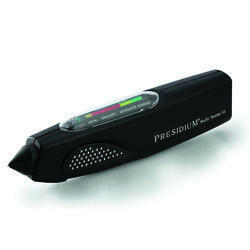 * Presidium's Multi Tester was the world's first tester that tests for both colorless diamonds and moissanites in a single instrument. Its measuring probes and electronics circuitry detect data from the gemstone being tested via a customized micro-controller, identifying colorless diamonds and moissanites based on their thermal and electrical properties. * PMuT III has a retractable probe tip that ensures consistent pressure against the gemstone during testing for more reliable results. With the industry's thinnest probe tip size of 0.6mm, the PMuT III tests colorless diamonds as small as 0.02ct. * Enhanced with additional features, the Synthetic Diamond Screener II now tests for diamond melees as small as 0.02 carats with instantaneous results, through the measurement of UV absorption. * The Synthetic Diamond Screener II is developed by Presidium to help screen out Type IIa colorless diamond, which is likely to be synthetic and created through chemical vapor deposition (CVD) or high pressure high temperature (HPHT) syntheses, from the natural Type Ia colorless diamond. * When subjected to this deep UV irradiation, Type Ia and Type IIa diamonds each absorb different amount of UV light. Type IIa diamonds allow deeper UV light to pass through and thus its UV light absorption ability is low. This difference in the light absorption is significant enough to aid in differentiating between colorless Type Ia and Type IIa diamonds. 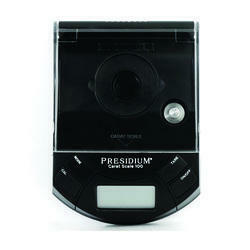 *Presidium Gem Computer Gauge measures the dimensions and estimates the weight of loose and mounted gemstones with precision, speed, and ease. *It is the only gauge in the industry that is able to give direct estimation of the weight of various gemstone of a range of 9 popular cuts, giving users the convenience of not having to dismount their gemstones from its jewelry settings. *After entering the weight and the measurements of a gemstone, the Gem Computer Gauge is alternatively also able to be used to estimate the identity of the gemstone, by computing its S.G. value and referencing the internal stored database. *With PGCG's computer interfacing, gemstone measurement records can be easily imported and printed. PGCG also comes with a CD-Rom that lists the S.G. value, R.I. value, and hardness measurements of 133 common gemstones in the market for handy reference. 2) This product comes with a protective carrying case box that has an auto-magnetic power off when gauge is placed back in the carrying case, to help preserve battery. 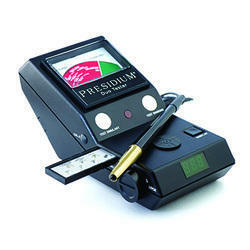 * The Presidium Gem Indicator, the only handheld tester in the industry specifically for colored gemstones, indicates up to 31 different types of colored gems based on their thermal conductivity and even features a color input function that allows users to select from a range of 12 common colors, thereby achieving more accurate results. With an easy-to-read clear digital LED screen, this smart thermal tester also comes with the Presidium patented refined changeable probe tip, which ensures minimal equipment downtime. * The Presidium Gem Indicator is an enhanced and more convenient handheld version of the revolutionary Presidium Gem Tester/Colored Stone Estimator. * The Presidium Gem Indicator probe consists of two linked thermometers; one which is heated electronically, while the other is cooled by the gemstone being tested. The difference in temperature creates an electrical output, which is then amplified and displayed on the new digital organic LED display. * It is simple to use, easy to maintain and quick in giving you intelligent results about your colored gemstones. Advised to run the calibration process if you are operating in ambient temperatures of 20 DegreeC - 33 DegreeC (68 DegreeF-91 DegreeF). 1) 1 x 3V battery (provided with product, approximately 5000 hours of battery life)2) This product comes with a protective carrying case box that has an auto-magnetic power off when gauge is placed back in the carrying case. * Presidium Electronic Gemstone Gauge is the industry's first digital gemstone gauge and remains the only reliable one able to convert gemstone dimensions to estimated carat weight for round brilliant-cuts. * Utilizing solid-state electronics to accurately measure up to 1/100mm, this gauge also features a clear and visible high-tech digital display for ease of reading measurements. Its touch button zeroing allows the convenience of resetting to zero at any measurement point. * A high-setting jewelry attachment also allows easy measurement of mounted gemstones and its subsequent conversion to carat weight. 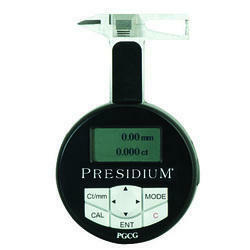 * The Presidium Electronic Gemstone Gauge also includes the Presidium Gemstone Weight Estimation Table, which corresponds millimeter conversion to carat weight estimation. * By measuring the quantity of light reflected through the stone, the Presidium Refractive Index Meter II (PRIM II) is able to separate diamonds, moissanites and other colored gemstones via the Refractive Index (R.I) of these polished gemstones. * Unlike a traditional refractometer that has a limited range of R.I measurements and thus cannot be easily used to measure R.I of certain gemstones, the PRIM II is able to measure a wider range of R.I value from 1.000 to ~3.000, therefore covering the commonly known gemstones in the market and can also measure RI of diamonds, moissanites and other diamond simulants such as high zircon, strontium titanite, etc. * In addition, a fast and clean test can be easily done with the PRIM II, without the inconvenience and messiness of R.I liquid used in the traditional refractometer. * The PRIM II also comes bundled with a CD featuring new software that provides a database of more than 50 gemstones with their various properties and possible origins, and a program that enables the user to enter known properties of the gemstone such as color, S.G. value, hardness, etc to ascertain what possible gemstone it is from the database information.